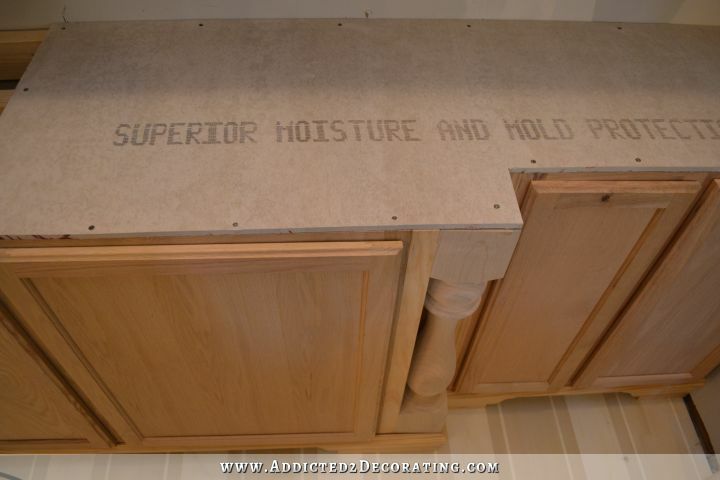 Disclosure: Concrete Countertop Solutions provided me with the materials to make my own pour in place concrete countertops using their products free of charge. All opinions are my own. My brother will be helping me with the mixing and pouring part. I brought all of that concrete (twenty-four 50-pound bags) from the end of my driveway into my garage by myself and stacked them on the countertop in the garage, but that was a struggle, and I was exhausted when I was finished. I can’t even imagine trying to mix and then carry twenty-four 56-pound buckets full of concrete, and lifting them, one after another, up to those countertops to pour them out. I’d estimate I could mix, carry, and pour about four or five of those by myself before my arms would turn to Jello. I don’t want to take any chances, so Saturday will definitely be a time to call in reinforcements. But before that can happen, I have to do the rest of the prep work! I’ll show you what that entails. For my countertops, I’m using products from Concrete Countertop Solutions, and I’ll be using something similar to the Z Liqui-Crete system. The only difference is that instead of purchasing concrete at a place like Home Depot or Lowe’s and mixing their Liqui-Crete mixture into the store-bought concrete, I’m using a new product from Concrete Countertop Solutions that has the concrete as well as all of the Liqui-Crete additives already combined in one bag, so I just have to add water. The mix is white and produces a white countertop. You can keep it white (which is exactly what I’ll be doing), or you can stain it to any color you want. 1. 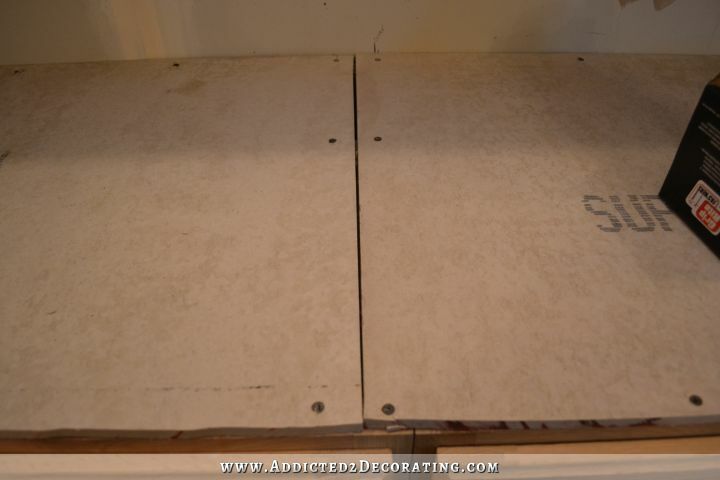 Cover the cabinets with concrete backerboard. To start the prep work, I brought in a 1/2-inch piece of concrete backerboard (purchased at Home Depot) and placed it on the cabinets. In their videos, they used Durock, but I prefer Hardibacker. 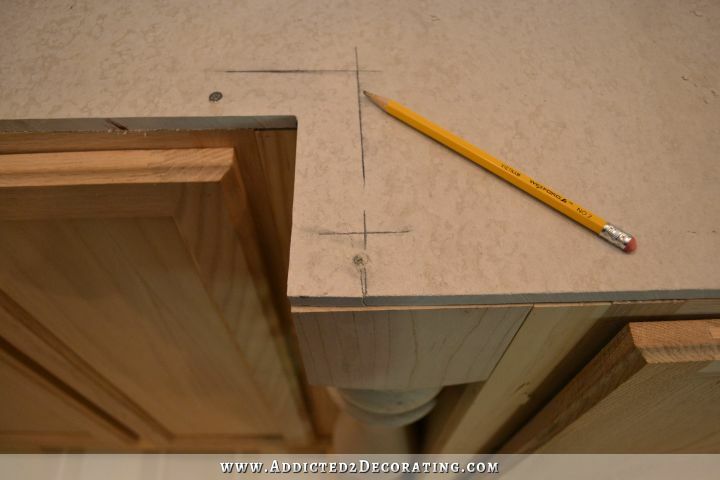 Then I used a pencil and marked the underside of the concrete board, tracing along the front edges of my cabinets to mark where it needed to be cut. 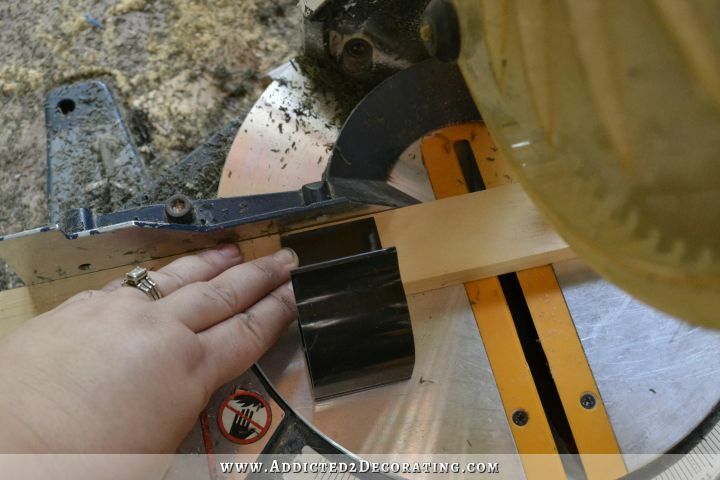 I used a Hardie blade in my circular saw to cut the concrete backerboard. (Click here to see what that looks like.) Those blades are expensive (about $55), but they’re so worth it. With the board cut to size, I then placed it back on the cabinets and screwed it down using 1 1/4-inch drywall screws. 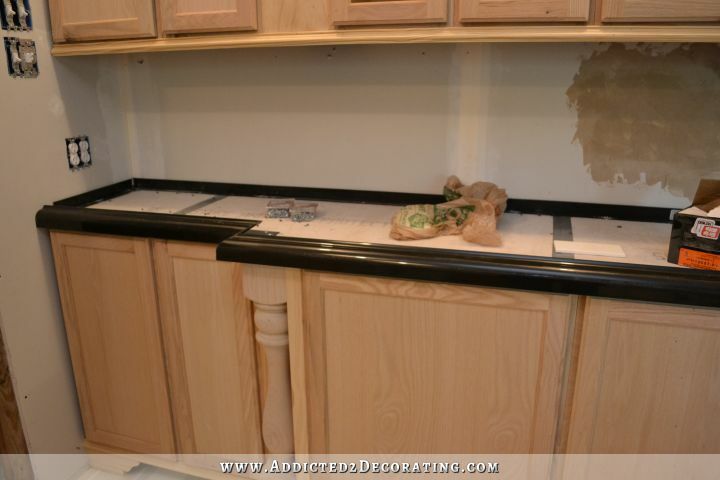 You can see that the concrete board comes right to the edge of the cabinets. There’s no need to allow for any overhang with the concrete board. My wall on the left side isn’t square, so I ended up having to piece together three pieces of Hardiebacker for this countertop. 2. Tape seams with duct tape. My not-so-square walls plus my not-so-perfectly-straight cutting skills left me with small gaps between the pieces of backerboard. Those are gaps that concrete could seep through. 3. Attach the form edges. …and then put it on the other side and marked the edge. 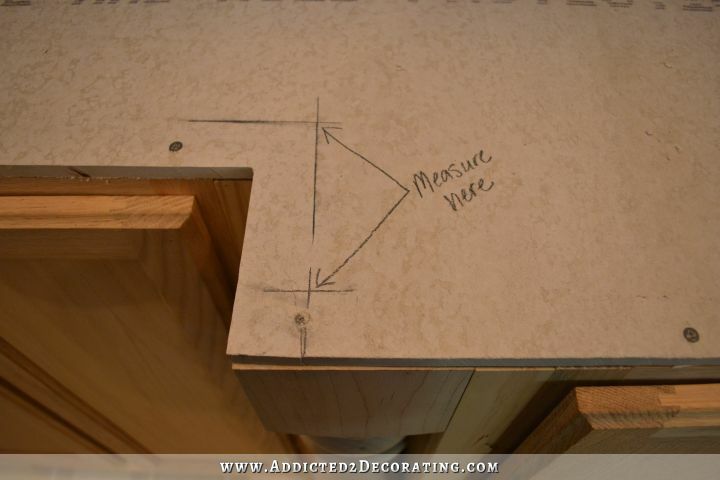 The points where the two lines intersect give me the points where I’ll measure when measuring to cut the edge profiles. For example, if I were wanting to cut the short vertical (in the picture) piece of edge form, I’d measure between these two points. 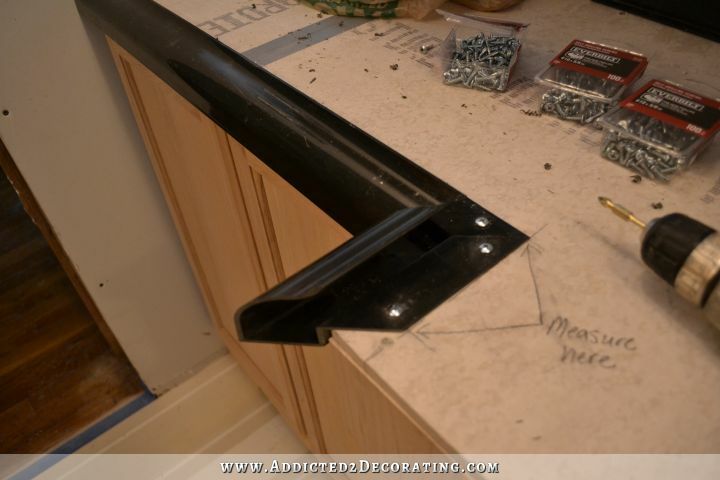 Concrete Countertop Solutions sells a set of jigs called Edge Expert that help hold the edge profiles completely straight while you’re cutting them. It wasn’t really a problem. I ended up using a 1″ x 2″ piece of lumber, and placing the edge profile on the lumber so that it would sit straight while I was cutting it. I also had a relatively new blade in my saw, and I cut the form pretty slowly so that I didn’t put any unneeded pressure on the plastic form. I made it work, and it all ended up just fine. But if I had to do it again, I’d made sure I had a set of Edge Experts to make the cutting easier. 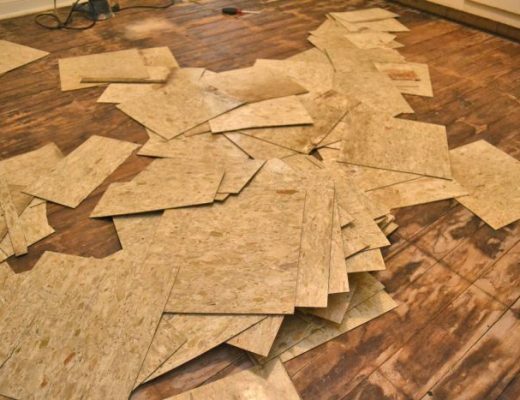 The actual cutting was easy, but when working with the long pieces propped on top of the 1″ x 2″ board, they had a tendency to shift around if I didn’t pay close attention to them. The Edge Experts are designed to hold the forms in place on the front, back, and bottom to prevent that shifting around. Anyway, I made it work. My only very insignificant complaint so far is that I found myself wishing that the edge profiles were made of a different color plastic other than black. I didn’t have any pen or marker that would show on the black. But I found that measuring and marking with a piece of painters tape worked just fine. The cutting of the edge forms was very easy. 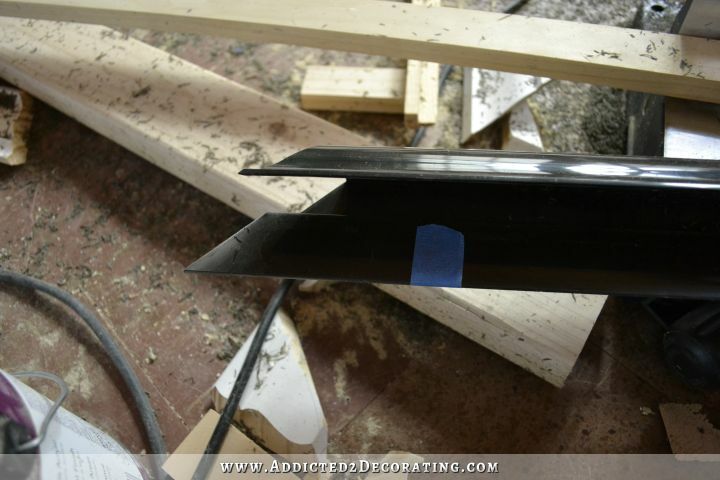 The forms are made of thick, hard plastic, and my little miter saw had absolutely no problem cutting right through it, leaving perfectly smooth cut edges. As I measured and cut the pieces, I screwed them into place on the edges of the concrete board. You can see now why you don’t have to leave any overhang with the concrete board. 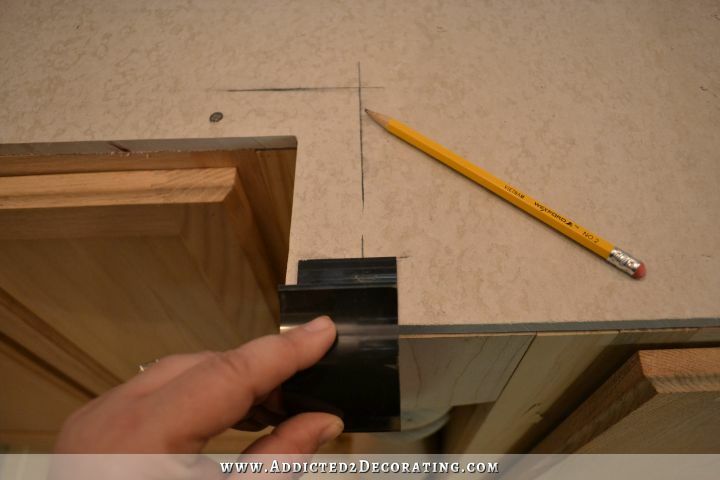 The edge forms provide all of the overhang that the countertop will need. Along the sides and the back wall, I cut and installed the straight forms. 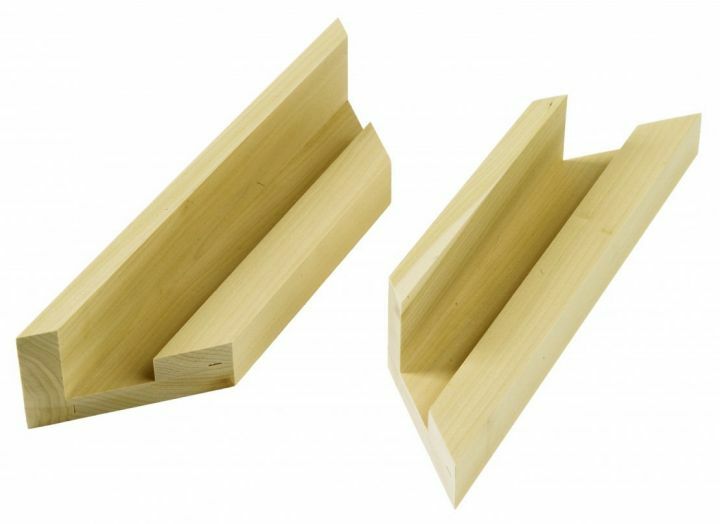 Obviously there’s no need for ogee edges against the walls, so each package of countertop forms includes several of these straight pieces to place against walls. 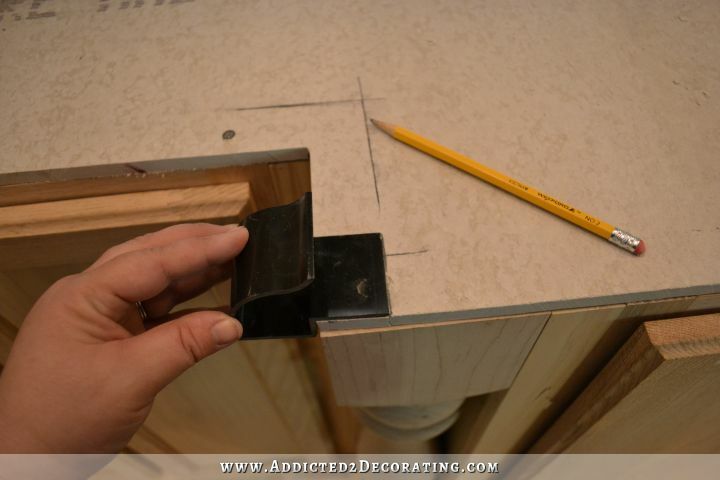 Unlike the front edge profile forms which get broken away when the concrete has dried, the back wall forms stay in place once the countertop is finished. It has a tiny lip on top, but it will easily be covered by the backsplash. With the forms in place, I caulked along the edges of the forms, as well as any other areas I saw where wet concrete could seep through. To secure the joints of the edge forms, I used duct tape and taped them together, making sure that the corners met as perfectly as possible before taping. I taped the edges as well as the bottom just to be sure that everything was sealed up and held together tightly. Obviously, you just want to be sure that no tape wraps around to the inside of the form where the concrete will actually be touching, or it’ll leave lines in the dried concrete. 4. 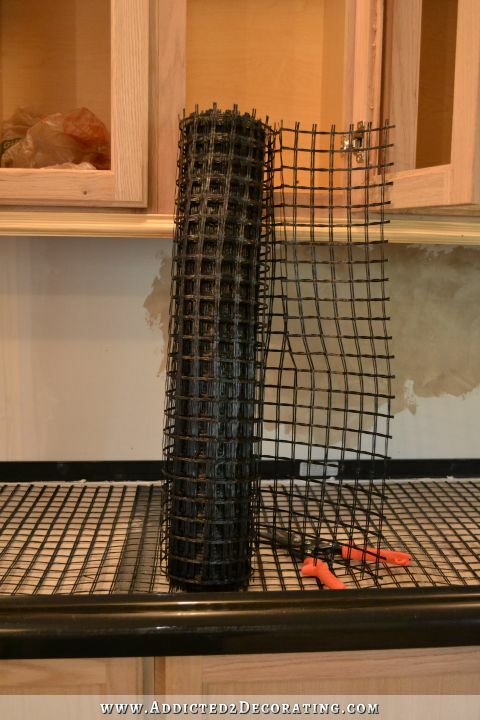 Attach fiberglass mesh to concrete board. The final step is to add the fiberglass mesh. 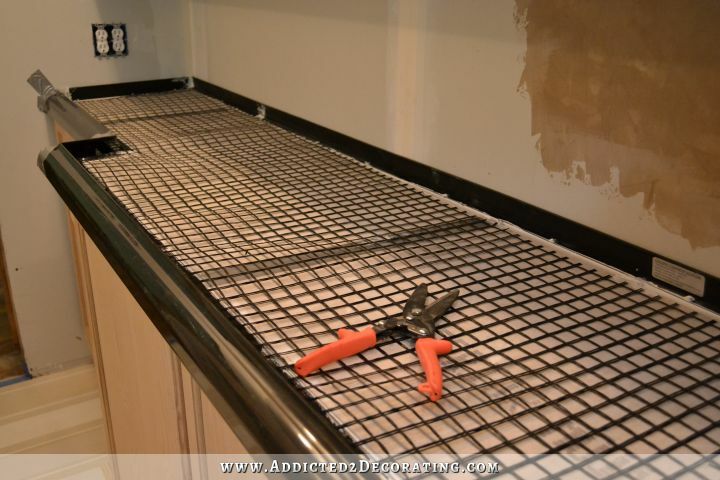 With the Liqui-Crete system, this is used in place of metal wire that you’ve probably seen being used in other types of DIY concrete countertops. I simply rolled it out and then cut it to size to fit just inside the forms. And by the way, those shears that I used to cut it are overkill. (Are those metal shears?) The fiberglass mesh can be cut with regular ‘ole scissors. No fancy tools are needed. But seriously, the only scissors I can find in my house at the moment are my one and only pair of hair cutting scissors, so I opted for the overkill with these shears. So I just snapped off the longer ones, leaving the two shorter ones. 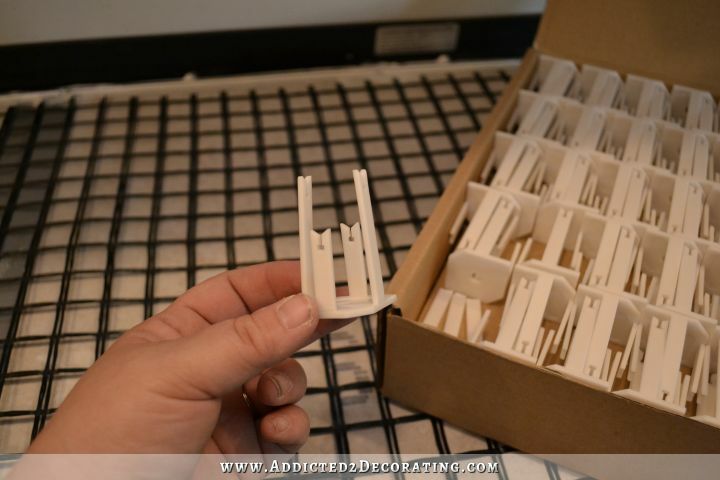 And then these plastic clips are used to hold the mesh at the perfect height. I started by attaching the clips to the front edge of the countertop (along the ogee edge), and then screwed those down. Then I flipped the mesh over the front of the countertop, attached the rest of the clips, flipped it back into place, and screwed the rest of the clips down. And here it is…my completely prepped, ready-for-concrete countertop form! Now I just have to lather, rinse, and repeat three more times, and the prep work will be done! And thankfully, two of those countertops are tiny, so those will go very quickly. Next step: poured concrete countertops! 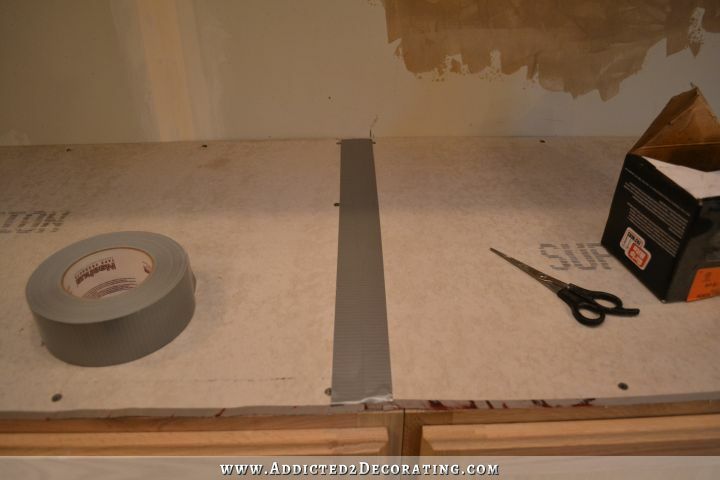 How To Make Concrete Countertops – The Cliff Notes! This looks do-able so far, right? I mean, it’s pretty straightforward. Cut and install concrete board. 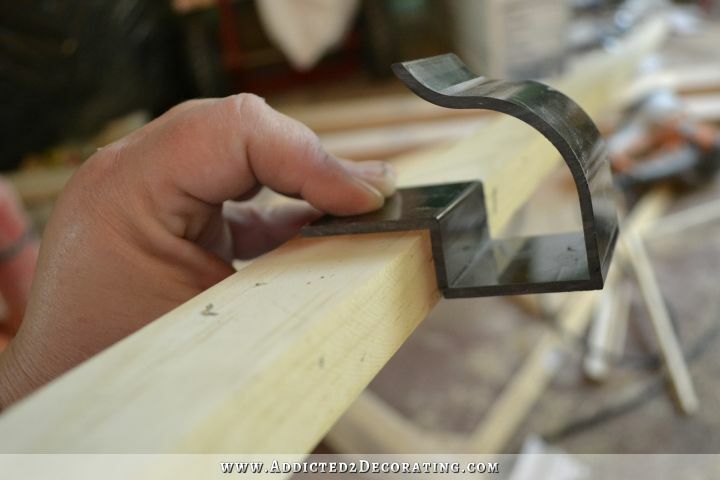 Cut and install the edge profiles. Caulk. Tape. Add the mesh. Then you’re ready to pour concrete. On the difficulty scale so far, I would rate this somewhere between “easy” and “intermediate”, and the only reason it’s edging towards intermediate is because it involves cutting mitered corners, and I know (because some of you have told me) that cutting mitered corners can be challenging for some of you. But if you’re experienced with a miter saw, then this is squarely in the “easy” range so far. Next Post It's Concrete Countertop Weekend! This is SOOOO interesting!!! I’m so glad I’m getting to watch this!! My one question is how do you get those edge pieces off after you’ve poured the concrete??? Hope that makes sense! If not, I’ll show you in more detail when I get to that point. It does make sense!! I’ll be watching and I’m glad you take lots of pictures! Oh My Gosh, I cannot wait to see the finished product. You have me dreaming of DIY Concrete countertops in my kitchen!! I really think I could do this. Go Kristi, go!! This is so great to watch evolve! Come on Monday! We really should have a National Brothers Day to celebrate our Brothers who are always there for us. Sharpie indeed makes paint pens that would work perfectly for this job. I have a couple of the white paint pens, they makes them in an oil-based formula that writes on plastic. They also make a water-based formula for paper. Was the gap that you duct taped too wide for caulk? 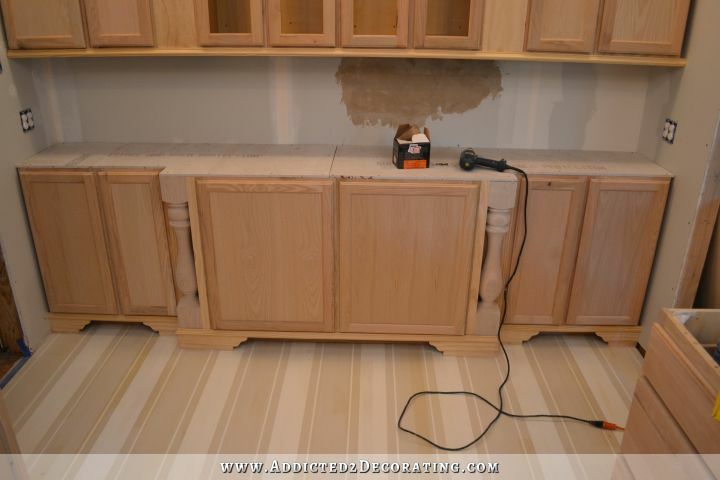 Can you show a close-up of the straight edge in the back where the backsplash will go? I was wondering how in the heck that would snap off, so it makes sense that it gets left there. I guess you have to be there to see that the backsplash really will cover it up. Great progress, Kristi. Looking forward to future posts. Caulk probably would have worked just fine, but I asked Ed at Concrete Countertop Solutions what he recommended, and he said to just put a piece of duct tape over it. Wow. It’s really coming along. NOW I can see real progress! I’ll be using a drop in sink, so there’s really no need for curved corners since they’ll be covered up. So I’ll use the back edge form to create my sink cutout. However, if you’re using an undermount sink that has a special shape and/or curves, they actually sell a sink form that can form curves quite easily. This is quite fascinating. I watched the video and have just a couple of questions. 1. how can you be sure you are getting all the bubbles out when using the vibrating sander on the edges, and 2. how often do you have to seal, or re-seal, the countertops after they are in use? Can’t wait to see the finished results. In my mind’s eye, it looks fabulous! They say to use a sander on the edges to get the bubbles out, and they say that when you think you’ve vibrated it enough, vibrate it more. 🙂 That probably won’t get out 100% of the bubbles, but you can go back over any bubbles and fill them in and sand them smooth. The Liqui-Crete concrete is so liquidy and smooth that it greatly reduces the chances of bubbles. But I’ve seen videos of people doing hand packed concrete countertops with much drier concrete mix, and intentionally NOT getting all of the bubbles out. Then they go back over it and fill in the voids with a slightly different color for some variation. Or I’ve seen others who leave the voids with the dry hand packed mix. It gives it a look like tumbled marble. It’s actually quite nice, but I don’t know how practical it is for a kitchen. As far as sealing, I’m actually not sure how often it needs to be done. I’ll need to check on that! Thank you, that answers my question. It sounds like an easy fix for any bubbles that remain. I did see some pictures on their website with ‘holes’ on the edge, which looked good, say for an outdoor kitchen installation. But, me, I know I’d want to fill in those edge holes, if for no other reason than to keep foodstuffs from becoming trapped in there. ewwww. can you say mold and bacteria??? I can visualize the softlly patterned white concrete countertops with the white subway tile backsplash in a herringbone pattern, the green cabinets, and the striped floor, and it’s loooookinnngg gooooood! No matter how well you vibrate the forms, there’s always the possibility that you will end up with pinholes in the edges. The easiest way to fill those is with our Z-Counter Patch. 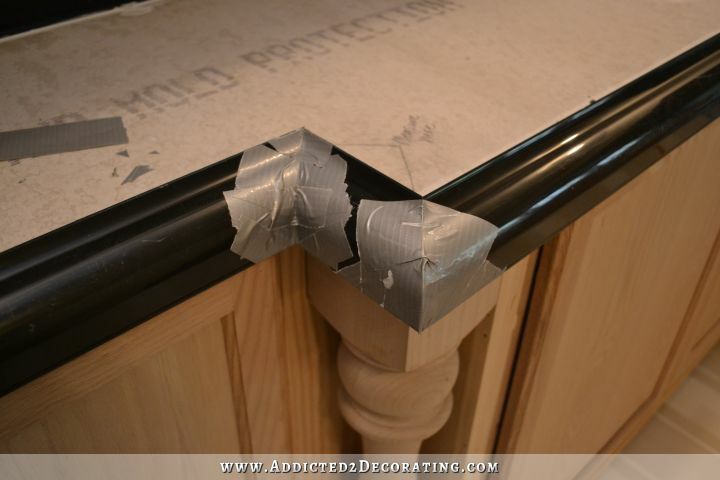 How often you need to re-seal is going to depend on how much traffic your countertop sees. Usually you will need to re-seal every 1-2 years with the sealer Kristi is using, our Z SiAcryl 14. Kristi — you make it seem like it is DIY friendly. Love this series you are doing on the kitchen! We used this system and poured our own concrete counter tops. It was easy! 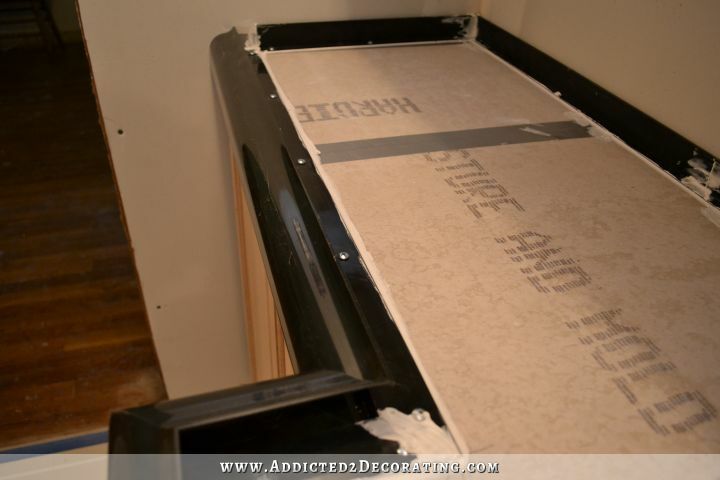 One thing we did that is not in the steps above, we took a roll of plastic and laid it out from the back to the edge covering the top of the cabinets and draped to the floor before we screwed on the concrete backer-board. We did not have to worry about the plastic falling off since it was securely screwed down and it helped protect the front of the cabinets from concrete spills/messes that occurred. We left the plastic in place through the pour, staining, and sealing processes. 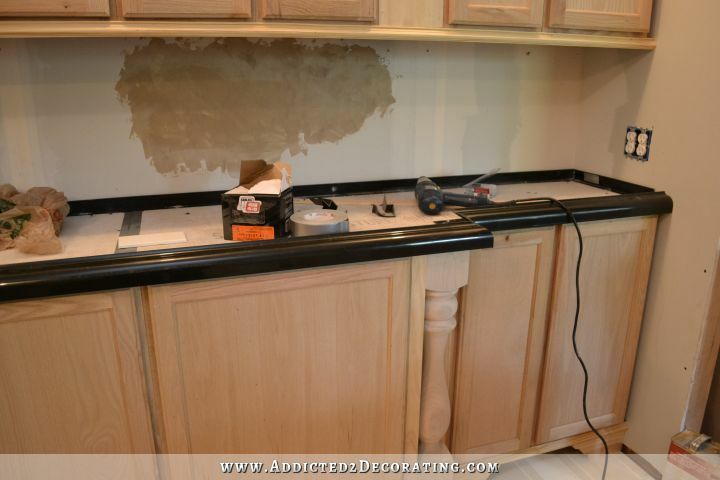 Once the counter tops were finished, we took a utility knife and cut the plastic right under the counter top. You can’t see the plastic once it is cut off and it was easy clean up, not to mention that I like the added bonus of not “imagining” the dust from the concrete backer-board falling into my drawers and cabinets. Looking good! It really does seem somewhat easy. I think, as you said, the trick is in the cuts and also you do need someone with strength to help you. Well, not you, but us average ladies who don’t go hauling lumber etc around everyday! BTW, love your engagement ring! Have always been a huge fan of the emerald cut. Can’t believe you are wearing it for all this work! Once again, I am anxious to see how this comes out. I know it will be perfect. I have one question and I may have to go to Concrete solutions for an answer. Can you have an overhang with concrete countertops? 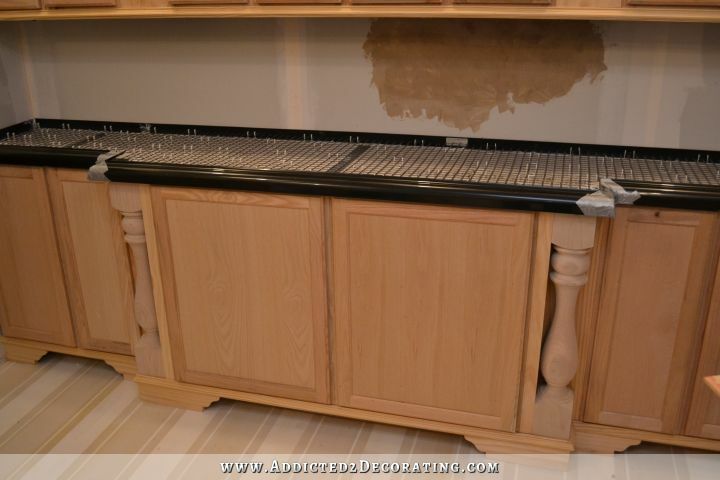 If I would attempt this (or have it done) in our downsized house I plan to use an old dresser for my kitchen island. However, I plan to add shelving to both sides of it for appliance storage. That should not be a problem, but I would like it to over hang at the back like a breakfast bar, but not use it for that. I like to have somewhere to dump the groceries when I bring them in and I also like to have seasonal flowers in a vase on the island. I don’t want to use my work space. So I would want some extra width that is not supported by a cabinet. Would the backerboard be enough to hold it, or does it involve another kind of framing? Yes, you can have an overhang. 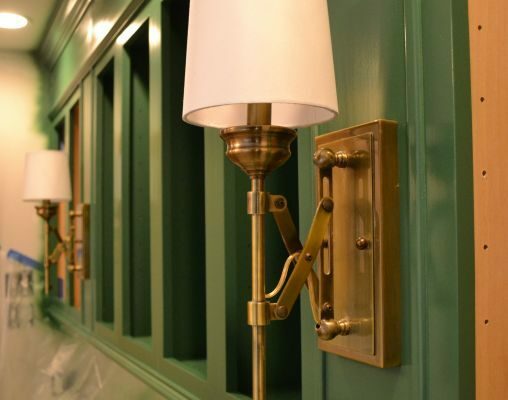 It would probably be wise to support it with legs or corbels or some other kind of bracket, like you generally see on a breakfast bar that overhangs a countertop. Although it’s very likely that once the concrete is completely dry and cured, it’ll support its own weight, especially on a small overhang. 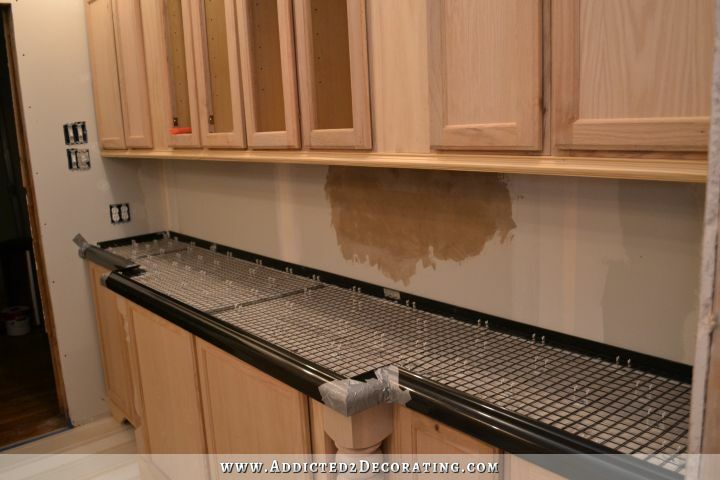 You can have up to a 12″ overhang without any permanent support if you’re using the Liqui-Crete system. You’ll just need temporary supports (2x legs) while the concrete is curing. Like Kristi said, a larger overhang would require additional support. Looking good! Can’t wait to see it finished. I am wondering though if I should come over with Rod and supervise the pouring. Hope you are going to have that pretty floor covered good. Just watching Kristi wears me to a frazzle with all of this work she does! Doesn’t she know that work is a 4 letter word?? Like your delightful mother, I gasped when you said doohickeys. You’re so much smarter than that, but when I saw the picture of the doohickeys, there was just no other word for them. Only a picture would work. LOL. Yes, Mom, please go over and supervise. You could run out and get them lunch, etc, and you could make sure the laughter keeps flowing if things should get a little rough. I love you for spawning such a DIY blogger. It’s the only blog I have ever followed, and it is so interesting. You are making this look do doable for me! Now to find that list so I can add it! WOW!!! this is sooo exciting. Can’t wait to see it finished. Thank you so much for sharing your passions and talents for DIY with all of us who follow your progress. I can’t wait for each new update. It is the first thing I look for each time I check my emails, and when I see a new post from you I always read it before checking any of my other emails. You are a great inspiration to my wife and I. Can’t wait to see the next post. It all looks so great. You amaze me! 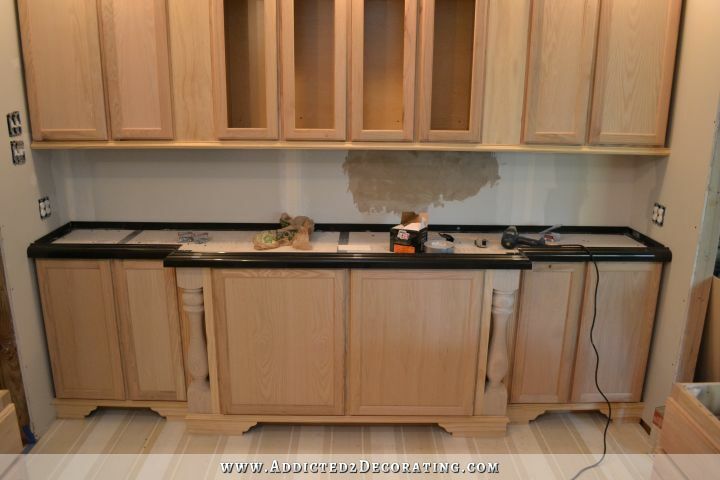 I was a little worried though because I don’t recall you mentioning if you have to have extra support under your cabinets when having concrete counters. I may have missed it but my hesitation with doing this at my own home was the weight it puts on the floors, etc. Sorry, if you already covered that…I just get so dang excited reading your posts that sometime I skip the technical stuff. 🙂 You are the bomb! There’s actually no need for additional support with concrete countertops. A 1.5-inch-thick slab of concrete weighs 18.75 pounds per square inch…ummmm…that should have said per square FOOT!!! 😀 Any cabinets should be able to hold that. And your floor should definitely be able to hold it. If they can’t, then they’re not safe to even walk on. 😉 But really, people think of concrete as being so very heavy, but it actually weighs just a bit less than a piece of granite of the same size and thickness. Would this company consider offering a discount to your readers? I am very interested in possibly making a purchase. Thank you for sharing. I’m so excited! I can’t wait to see the next stage! You make it look so simple! So excited for you! Fabulous Kristi! I feel sooo excited watching you transform this space! I’m the DIY person at our house so am always amidst the action, but to be able to sit (comfortably and cleanly!) and watch someone else doing something like this is simply fantastic! Well done! At the end of your post you say all you have to do is ‘lather and rinse’? You mean your hands???? Can’t wait until pour day! Good luck! I cannot wait for part 2, 3, 4, etc! Love your detailed pics and instructions! Keep giving all of us inspiration….. Am going to try it in my bathroom……. Can’t wait!!! So I think I might be sticking with mixing the concrete in brand new, clean Home Depot buckets. I might rent a bigger, stronger drill/hand mixer, though. That way I won’t burn out the motor on my drill by mixing all of those bags. Oh! That’s sad that your home depot doesn’t rent tools!! I thought of the potential of a not quite clean mixer as well, but my only solution was clean our or really well. I can understand being willing to do a bit extra work to avoid the potential contamination!! If it were a bigger project, it *might* be worth buying one new and then reselling it, but probably not for 25ish bags. 🙂 have fun and be careful lifting!! 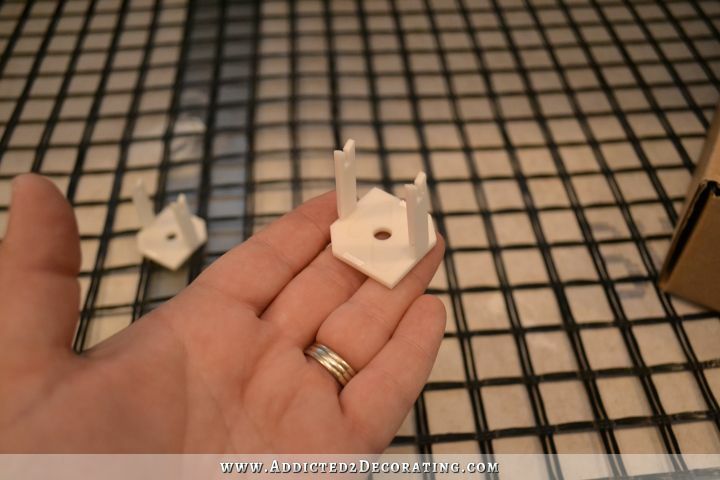 What bagged concrete did you use with the additive from the countertop company? I looked at Home Depot and there are a dozen choices… I can’t tell which one to use… I’m still in the planning stages, but I’m trying to price out the projects in my kitchen. Thanks! I actually used a new product from Concrete Countertop Solutions that has the concrete and the additive already mixed together in one bag. I don’t think they have it on their website yet, but they said they’re trying to have it on there by the middle of this month. The retail price is $29 per 50-pound bag. My kitchen (55 square feet of countertop space) took 19 bags. Anyway,they said if anyone is interested before they get it on their site, you can just give them a call and they’ll help you out. 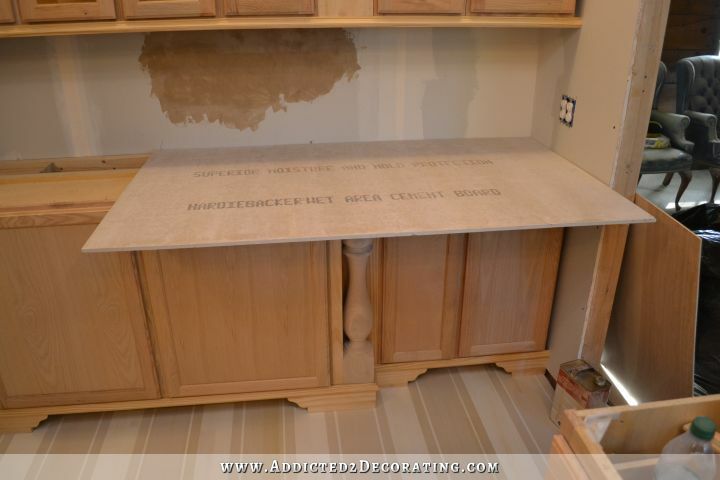 I just found your blog and, after trying to read the entire content in one sitting (insert snort here) I stumbled on this concrete counter top adventure. My hat off to you! You’re right, it’s doable, it’s not difficult but is very time and labor consuming and, yet, still, damn lady! You’re so ambitious and I’m almost shamed into trying this myself. Your results are spectacular. I love the look and think you’re talented–and not only because of the countertop venture. Hats off! Hiii!! This is THE BEST tutorial on concrete top i have seen !!! And i have looked at maaaaany! Wow! I love how you explained everything and actually made it look so easy! Im doing this on my kitchen and been looking at DIY videos and pics. So thanks for this! My only question would be, did u put a wood sheet to support the concrete sheet? Because they bent a lot so i wonder how you did for it to support the weight. Thanks a lot!! No, I didn’t use anything under the cement board. 1/2-inch cement board shouldn’t bend when placed on top of the cabinets, and it’s plenty strong to hold the weight of the concrete. FYI for any future readers – we did have problems with the cement board bending. We used Ikea cabinets, which aren’t as strongly supported around the edges, and one of our cabinets was very wide (thus very little support in the middle). We screwed in some wood supports under the cement board (the tops flush with the cabinet tops) for the concrete pouring process, then removed them after the concrete was cured. My engineering husband thought the cement board had a high chance of buckling in the middle without the extra supports! He looked up the cement board specs, and the cabinet edges were too far apart per the recommended support spacing. Sweet! This is so simple. I saw one at a Green Dragon Coffee shop recently and fell in love. Now I’m definitely going to give it a go. Hoping to pour our concrete today, but I’m stumped! How did you handle the panel between the counter and the refrigerator? Did you use the back wall form? Does it show after the concrete is set? 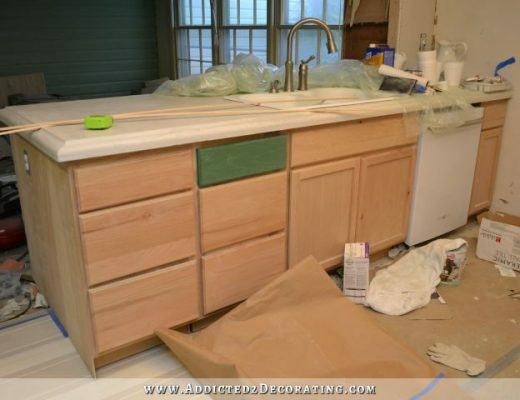 If you click the link at the bottom of this post and view Part 2 of this project, there’s a picture there showing that countertop before it was poured. I know I didn’t use the plastic form. It looks to me like I just taped the crack between the panel and the concrete board with duct. Since I wasn’t going to tile there, the black form would have shown. That’s doesn’t give you a level ledge on that side for screeding, but I just eyeballed it and got it as level as I could, and you can still screed and make sure it’s level from front to back.